If there is any newest poker cheating scanner device? or if the iPhone 6 can be a poker scanning camera to scan the barcode marked cards. As for the Nokia phone is old school style infrared scanning camera for the poker cheating scanning system, many players may know this poker scanner camera device. Do you want to get a special but normal looking poker scanning camera cell phone? Here we have good poker scanner option for you. To make the marked cards scanning camera as lesser as suspect by other poker players when it scanning the barcode marked deck. We discovered a new phone form - iPhone 6 as the most advanced poker scanner camera cheating device. It is easy to control, and fastest reaction to the poker analyzer system is within 0.3 second, and we can make it to cooperate with your own poker analyzer or CPU. 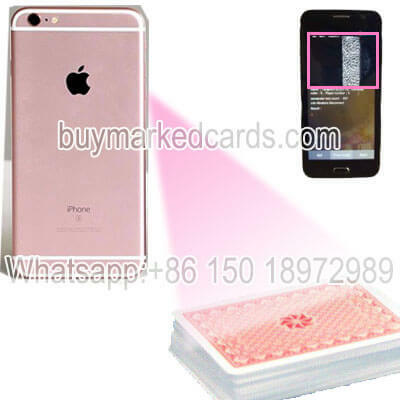 iPhone 6 poker scanner camera is adored by poker players once it is come to market. For such a good poker scanner camera device, everyone deserves to own one. Many players are concerns about the operation of this Poker scanner, and wondering if the settings are complicated. Actually it is very simple to use this Poker scanning camera to match the poker analyzer system, and put it within the right position, then it can scan the barcode marked cards in a fast way. It is just as simple as wearing the contact lenses to see the lens marked cards. 1. Newest iPhone 6 outlook for avoiding suspect.